Morris Mensor | Historic Jacksonville, Inc.
Morris Mensor was “well known as one of the enterprising businessmen” in early Jacksonville. A native of Prussia, he left home at age 19 and became a laborer in an oil factory in Hamburg, Germany. Within 6 months he was clerk and a year later foreman, supervising 1200 men. Accumulating a few thousand dollars, he returned home and gave the money to his parents to care for his younger siblings. When he sailed for America a year or so later, he could barely pay his passage, but on-board ship earned over $600 as an amateur musician—which he again sent home. In New York, he worked as a glazier and painter for a few years. Then in 1854, at age 42, he married 16-year-old Matilda Fisher. A year later, the couple came to San Francisco. With the gold rush over, they soon moved on to Jacksonville, where Morris became co-partner with his wife’s cousins in the Fisher Brothers mercantile. Within a few years he went out on his own, opening a mercantile in Phoenix. When health problems arose in 1876, he returned to Jacksonville and opened Morris Mensor’s New York Store at 170 S. Oregon in the old Brunner Building. 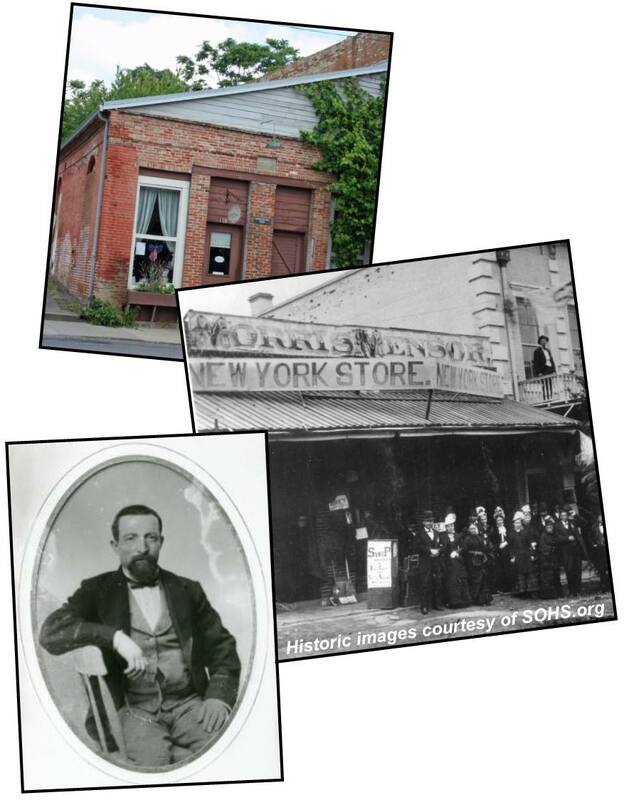 Mensor operated his New York Store general merchandise business until his death in 1887, one of the handful of merchants to remain in Jacksonville after the railroad by-passed the town.